You think sugar is toxic? These six money mistakes will kill your financial life faster than a couple of gallons of high-fructose corn syrup. "Consumers who learn how to avoid common financial missteps will be better prepared and have a much brighter financial future," said David Jones, president, Association of Independent Consumer Credit Counseling Agencies. What toxic money mistakes do you need to avoid? particularly when you're living life on the edge. Emergency savings allow you to survive costly unexpected events, like a car repair, an uninsured medical expense, job loss and even a divorce. Any of these events can throw you into debt or in the hands of a predatory lender. Ideally, you want to have three to six months' worth of living expenses. But if you can't save that much, save what you can. Even a few hundred dollars in the bank can make a difference. Letting bad habits blow your budget. The term "budget" is often confused with the term "deprive," which is why so many people refuse to do it. Having a budget doesn't mean that you live a life of deprivation. The real reason you make up a budget is to make sure that you are spending your money on stuff you really want. Too often, consumers don't write down where they're spending their money, so instead of spending via plan, they spend thousands of dollars on things like coffee, junk food machines and Happy Meals. Seriously, if you want those things, buy them. But do it consciously, knowing how much you're spending, rather than letting your bad habits take over. year's worth of bank statements and credit card bills and figure out what you're spending on everything from utilities to shoes. If you do that and find there's a black hole between what it seems like you're spending and what you have left at the end of each month, stick a notebook in your glove compartment or purse and start writing down where you're spending your cash. You might be surprised and horrified by how bad habits are gobbling up your money. Borrowing to buy. Credit cards are awesome. Rewards cards are even better, since they can pay you to use them. But they're only great if you pay off the balance every month. If you don't, you end up spending hundreds of dollars making some fat-cat banker really rich, while you have nothing of value to show for it. Borrowing to buy things, particularly at credit card interest rates, is a great way to make yourself feel poor because you never finish paying for last year's luxuries. If you're in debt now, make a plan to pay it off. If you're tempted to buy something on "sale" that you can't afford to pay for with cash, mentally boost the "sale" price by the credit card interest rate you'll be paying over the next year. The "discount" that's encouraging you to buy now will evaporate in a hurry. Paying debt with debt. Debt consolidation and payday lenders lure people in with promises that they can solve all your financial woes with yet another loan. Don't be fooled. What they don't say is that paying off credit card debt with a consolidation loan or meeting an unexpected expense with a payday loan does not make the debt or the expense go away. In fact, it's a really expensive short-term fix that can make meeting your next obligation all the more difficult. Bouncing payments. It doesn't matter whether you use a debit card or write checks - if you bounce a few payments, you're going to pay dearly. The average overdraft fee costs you $35. And since banks still sometimes "reorder" checks, one bounced payment can create a bunch of overdraft fees. Bankers have been encouraging people to "opt in" to expensive overdraft protection plans that allow you to buy things even when you don't have the money in your account to pay for it. A surprising number of people have "opted in" partly because the bankers come up with dire predictions of what might happen if you run out of money at the wrong time. Want a far more cost effective option? Hide $20 in your car for the rare "out of cash and gas at the same time" moment and drop the overdraft protection. Then let your bank "decline" your debit transaction when you're about to overdraw your account to buy a cup of coffee. That latte wasn't worth $40 anyway. Struggling alone. Ignoring a financial problem doesn't make it better. It almost always makes it worse, since "late fees" and interest charges rack up and push you deeper and deeper in debt. 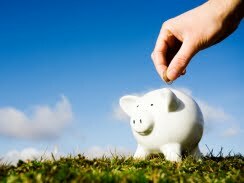 If you find yourself struggling with your day-to-day expenses, get yourself into a non-profit credit counseling office. They're easy to find and usually free. For a certified, non-profit credit counselor near you call Consumer Credit Counseling Service of Buffalo at 712-2060.